Port Falmouth Helicopter Sightseeing Tours Jamaica -Helicopter Sightseeing Tours from Port Falmouth Jamaica W.I. 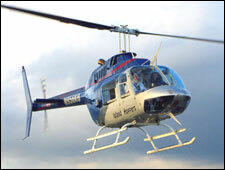 Find and book Falmouth helicopter sightseeing tours and Falmouth helicopter excursions from Falmouth Jamaica. Helicopter tours of Dunn's river falls and other popular attractions throughout Jamaica. Your Falmouth Jamaica helicopter tour begins with a personal meet and greet by our cruise port agent that will take you to the helipad. Please see helicopter tours offered for cruise ship passengers from port Falmouth Jamaica. 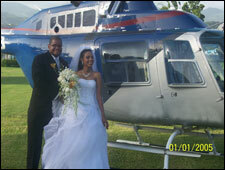 Helicopter tour prices covers 1-4 passengers and private round trip ground transportation from Falmouth Jamaica. Confirmation voucher with cruise arrival instruction is provided for all Falmouth helicopter tour booking; please email paradisevacationsja@yahoo.com or call 1876-840-5639. With this tour you'll get off to a flying start along the coastline, past Rose Hall Great House the prior home of Annie Palmer (The White Witch) to Falmouth, Jamaica's third oldest town. From there you will turn inland and fly over the Hampton Sugar Estate and travel cross county to Montego Bay where you will land back at the Montego Bay (MBJ)International Airport. Spread your wings with this tour which includes the Montego Bay Ecstacy tour plus an additional leg over the Cruise Wharf to Round Hill, one of Jamaica's most exclusive destinations, before turning inbound to Montego Bay International Airport. Soar to new heights on this deluxe tour. On departure you will get a breathtaking view of Montego Bay, before winging your way to Negril, one of Jamaica's premier destinations. From there you will fly along the 7 miles of white sand beach past world famous Rick's Cafï¿¿o the light house at the westernmost point of the Island. You will then turn inland over cane fields to the beautiful YS falls, where you will continue on to Appleton Estate, the home of Jamaica's finest rums. Continuing on you will fly over the Cockpit Country with it's unique geology to Falmouth. A final turn will fly you along the coastline, past the Rose Hall Great House, to the Montego Bay International Airport.